From reviewer Karen Heunemann's blog, "That Which Matters." What is it about Lizzie? Why, out of all of the marvellous protagonists that YA literature contains, does Lizzie captivate me? Every time I read Who is Frances Rain?—and this is the fourth time—I want to know more of Lizzie’s story: I want to see how her final years of high school progress; I want to know (despite statistics regarding the permanency of high school romances) more about her relationship with Alex; I want to follow her on the rocky road that the next few years will be. For, once again, Margaret Buffie has created a novel in which there are no solid answers in the end, only hope and promise. Her characters are so real, in both their flaws and their strengths that we implicitly trust in the truth of the narrative, and I at least want to travel with the characters for quite a while longer. Who is Frances Rain? has been challenged and banned a number of times, for its inclusion of both the paranormal and an unwed mother. 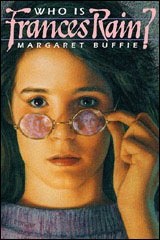 The illegitimate child in Buffie’s book is born in the early years of the twentieth century, but more than suggesting that such happenings belong in the past and our society has improved since then (a trope that was common in the first 6 decades of the twentieth century), Buffie is providing a continuity between women of the past and young women such as Lizzie, who are learning to make their own way in our modern world. The physical and emotional fortitude Frances Rain presents is a strength that both Lizzie and the reader can draw on in their own lives: Frances Rain is a part of Lizzie’s past, and shows Lizzie a way to move forward into her future. Perhaps that is why I want Lizzie’s story to go on: I want to be part of her continuing to grow into the strong, self-sufficient woman who was Frances Rain.